The Binomial Distribution is one of the most valuable and commonly used statistical tools. The Binomial Distribution is used whenever a process has only two possible outcomes. For example, the Binomial Distribution would be used to determine the probability of getting 4 heads on six flips of a coin. It could be used to determine the probability of 6 out of 10 people sampled voting Republican or the probability of 3 out of 20 people sampled having green eyes if the percentage of the overall population having green eyes or voting Republican is known. Problem 3: Finding Mean, Variance, and Standard Deviation Given p (Probability of Success) and n Number of Binomial Trial Occurrences. Problem 4: Finding the Mean, Variance, and Standard Deviation of a Sampled Proportion (p) Given 1 Large Sample Containing n Subjects. Problem 5: Probability of Getting a Certain Number of Sales for a Given Number of Customers if the Probability of Buying is Known. Problem 7: Finding the probability of a certain type of package passing down a conveyor belt if the probability of that type of package passing by is known. Problem 8: Finding the probability of getting a 4 at least twice in 5 tosses of a pair of fair dice. Each trial has only two possible outcomes: "success" or "failure." The probability of a success, p, of each trial is known and doesn't vary. As a general rule, the Binomial Distribution should only be applied to a sample if the population size is at least 10 times larger than the sample size ( n number of trials in the sample). If samples are taken from a finite population, the Binomial Distribution can only be applied if the samples are being replaced. If the samples are not being replaced, the HyperGeometric Distribution can be applied. If samples are taken from an infinite population, the Binomial Distribution can be applied whether or sampling is done with replacement..
A Bernoulli Trial is a single random experiment whose outcome can have only one of two possibilities: "success" or "failure." An example of this would be one flip of a coin. This is the same as one trial in a sample of n random trials whose outcomes are independent and have only two possibilities. A Bernoulli Process is a sequence of Bernoulli Trials. An example of a Bernoulli Process would be 5 flips of a coin. A "Bernoulli Process" is just another name for a single sample of n random trials whose outcomes are independent and have only two possibilities. These are exactly the samples that the Binomial Distribution is applied to. A Bernoulli Distribution is just another name for the Binomial Distribution where the number of trials, n, equals 1. The term "Bernoulli Distribution" is not really an essential concept. The term is mentioned often in statistics books so it is presented here just to provide familiarity with it. If you are trying to estimate a population proportion from the results of a sample proportion, see the module of this course entitled Confidence Intervals. Estimating a population proportion from a sample proportion is explained in the second half of that course module. In this module, we are doing almost the opposite of that. Here we are describing how to calculate the probability of a sample proportion if we know the population proportion. This is the variable that will have 1 of 2 possible outcomes. Population Proportion = p = proportion of a population having a certain outcome or characteristic. p also equals the probability of a certain outcome on 1 trial. q = p - 1 = proportion of a population not having that outcome or characteristic. q also equals the probability of not getting a certain outcome on 1 trial. then q = 1 - p = the probability of failure. The Probability Density Function (sometimes called the Probability Mass Function) calculates the probability of exactly k successes occurring in n trials. This is the probability that the count of successful outcomes, X, equals k for n trials. For example, the Probability Density Function would be used to calculate the probability of exactly 4 heads in 6 flips of a coin. The above expression is known as the Binomial Coefficient and often referred to as "n chose k." This is equal to the number of possible ways to choose k successes from n trials. This is equivalent to the total number of possible combinations of n objects taken k at a time simultaneously. Problem: Calculate the probability of exactly 4 heads in 6 flips of a fair coin (50% of either heads or tails). The probability of exactly 4 heads in 6 flips of a fair coin is 23.4%. The probability of exactly k successes in n trials. This is the probability that the count of successful outcomes, X, equals any number between k and 0 for n trials. This equals the sum of the probabilities that X equals each number from 0 to k for n trials. For example, the Cumulative Distribution Function would be used to calculate the probability of up to 4 heads in 6 flips of a coin. The probability of up to 4 heads in 6 flips of a fair coin is 89.0%. The Normal Distribution can be estimated using the Binomial Distribution if n is large and p and q are not too close to 0. If variable X is Binomially distributed and has parameters n (number of trials) and p (probability of success on each trial), for large values of n the distribution of X is approximately Normal. The mean and variance of the approximately Normal distribution of X are np and np(1-p). These are the same as the mean and variance of Binomial distribution that has parameters n and p.
The Normal approximation does not work well for small values of n. The Normal approximation should only be used if np>10 and np(1-p)>10. The Poisson Distribution can be estimated using the Binomial Distribution if n is large and p is small (less than 0.10). This approximation works well if n≥100 and np<10. The approximation is valid because the Binomial Distribution converges to the Poisson Distribution and n (the number of trials) approaches infinity and np remains fixed. Problem: What is the probability of getting between 3 and 5 heads on 10 flips of a fair coin ( p = 0.50) ? There is a 56.83% probability of getting between 3 and 5 heads on 10 flips of a fair coin. This same problem is solved in the Excel Statistical Master with only 1 Excel formula. That's it. 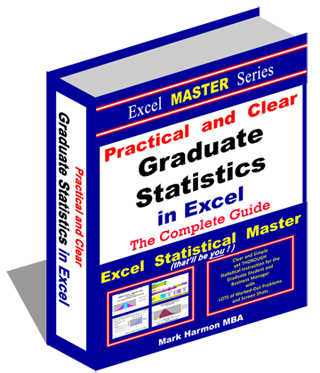 The Excel Statistical Master teaches you everything in step-by-step frameworks. You'll never have to memorize any complicated statisical theory. Problem: What is the probability of that between 2 and 4 products out of 100 require service if 2% of all products require service? There is a 27.25% probability that between 2 and 4 products out of 100 will need service if the probability of a product needing service is 2%. This same problem is solved in the Excel Statistical Master with only 1 Excel formula. The Excel Statistical Master is the fastest way for you to climb the business statistics learning curve. This problem uses Binomial formulas (Sample Occurrence Formulas) because what is being measured is the mean number of occurrences from a large number of individual samples that each have only two possible outcomes. The expected number (Mean) of payouts every hour is 2.6667 with a Variance of 2.4889 and a Standard Deviation of 1.5776. Problem: In a large sales force, the ratio of salespeople having college degrees to those not having degrees is 5 to 2. Determine the mean, variance, and standard deviation of the sampling distribution of the proportion of salespeople not having degrees in a random sample of 30 salespeople. The problem uses proportion formulas because what is being measured is a proportion of a single large sample. The expected Sample Proportion (Mean) of the proportion of degreed salespeople 0.2857 (28.57%) with a Variance of 0.2041 (20.41%) and a Standard Deviation of 0.0825 (8.25%). Problem 5: Finding the probability of a certain number of sales for a specific number of customers given that probability of each customer purchasing, p (Probability of a sale), and n (Number of customers) is known. Problem: A store has been tracking how many of their walk-in customers make a purchase. data collection over a long period of time revealed that 70% of walk-in customers made purchases while they remained in the store. What is the probability of exactly 10 out of the next 15 walk-in customers would make a purchase? There is a 20.6% probability that 10 out of the next 15 walk-in customers will make a purchase if the probability of each walk-in customer making a purchase is 70%. Problem 6: Finding the probability of a stock trader being above average if the number of successful trades he has made is known and the probability of an above-average stock trader making a successful sale is known. Problem: An above-average stock trader makes a profit in 1 out of 4 transactions. An average stock trader makes a profit on average 1 out of 7 transactions. A below-average stock trader makes a profit on 1 out of 10 transactions on average. If a stock trader conducts 15 transactions and makes a profit on 2 of them, what is the probability of the stock trader being above average? 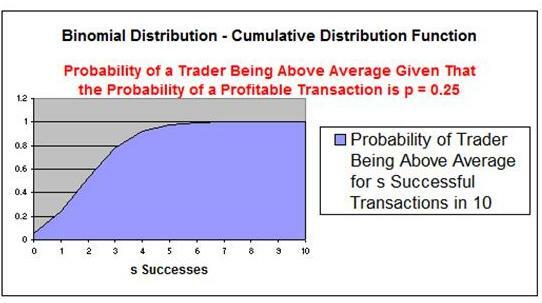 There is a 46.9% probability that the stock trader is above average if he completes up to 2 successful transactions in his next 10 attempts if the above average stock trader normally completes 1 out of 4 transactions profitably. Problem: A conveyor belt brings packages to a truck to loaded. The packages are either black or white. The probablity that a package is black is 40%. What is the probability that out of the next 10 packages, at least 2 are black and 2 are white? The only possibility of at least two packages being white and 2 black would occur if the number of black packages equaled 0, 1, 9, or 10. The probability of at least 2 packages being black and 2 white would therefore equal 1 minus the probability that the number of black packages equals 0, 1, 9, or 10. There is a 95.2% probability at at least 2 packages will be black and 2 packages will be white out of the next 10 packages if the probability of a package being black is 40%. Problem: Find the probability of getting a 4 at least twice in 5 tosses of a pair of fair dice. A fair die has a probability of 1/6 of landing on any of the 6 possible sides. There is a 86.7% probability of getting a 4 at least twice in 5 tosses of a pair of fair dice.